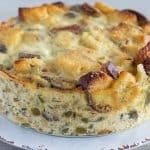 This recipe is like stuffing & bread pudding had a baby - the flavors of holiday stuffing, with the texture of traditional bread pudding. Preheat oven to 375 degrees. (I typically try not to use the oven for Instant Pot recipes, but this is an exception.) Cut off bottom ends of bread. Discard or save for another use. Cut bread into 1-inch cubes. Add bread cubes to large mixing bowl. Add oil, thyme, and garlic to bowl. Toss to coat. Spread bread cubes out on a large baking sheet. Bake until golden brown. Could take anywhere from 10-20 minutes, depending on the bread. Using sauté setting… melt butter in pot. Add mushrooms, onions, celery, bell peppers, and 1/2 teaspoon of salt. Sauté until veggies are soft and all their juices evaporate, anywhere from 10-15 minutes. Meanwhile… add eggs to a separate mixing bowl and whisk together. Then add heavy cream, 1/2 teaspoon of salt, and pepper and whisk again. Return toasted bread to same bowl you used to toss them. Add sautéed veggies and parsley. Mix well. Pour custard into bowl with bread and veggies. Mix well. Add 1 1/2 cups water to pot, along with 3-inch trivet. Turn on sauté setting to begin heating water. Spray 7-inch pan with nonstick cooking spray. Pour stuffing into prepared pan. Top with parmesan cheese. Cover pan with foil and place on top of trivet. Lock lid and cook for 50 minutes at high pressure. Once cook time is complete, quick-release pressure. Remove lid from pot and foil from pan. If you like, although not a must, place pan under high broiler for a few minutes to toast the cheese. Serve warm.